A geologically complex hill rising from the surrounding lowlands of the Bernwood Forest It lies adjacent to Bernwood BOA. Landscape Types: Brill Hill is a wooded and farmed chalk outcrop. Geology: Brill Hill and Muswell Hill consist of sandstone capping limestone, with the lower slopes being interbedded sandstone, limestone and mudstone. 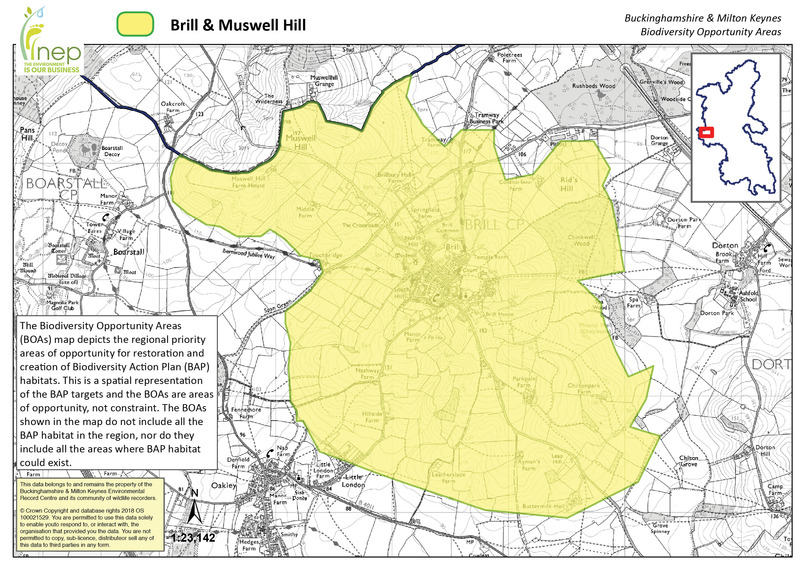 Topography: Brill and Muswell Hills are very steeply sloping hills (rising up to 185m) rising out of a low flat floodplain. Woodland – There are a number of small lowland deciduous woodlands in the area. Calcareous Grassland – Brill Common is a matrix of calcareous and acid grasslands. Acid Grassland – Brill Common is a matrix of calcareous and acid grasslands. Ponds – The area contains many potential BAP habitat ponds including many on the slopes of Brill Hill. Hedgerows – There is a good network of hedgerows around pre-18th century enclosures throughout the area, so many may be species rich. Archeology: There is a scheduled ancient monument at Brill and it is part of a much larger Mediaeval Hunting Forest.